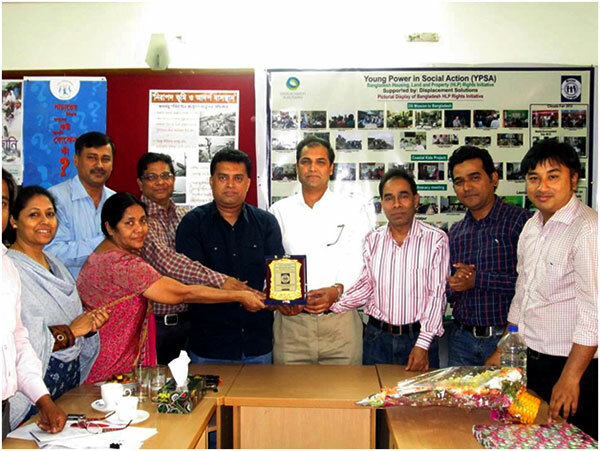 YPSA has given warm reception to Advocate Moktader Billah, former president of YPSA’s Executive Committee in an occasion held at the head office on 5 March, 2014. “Sustaining an organization takes time, planning and cultivation. The current reputation of YPSA that has been achieved step by step and we were able to do hard work under the leadership and guidance of Adv. Moktader Billah” said Md. Arifur Rahman, Chief Executive of YPSA while he was introducing him with YPSA officials. Mohammad Shahjahan , Focal Person of YPSA KM4D Division briefly presented the organizational profile and timeline of YPSA since 1985 to till date. After the organizational presentation, YPSA officials have handed over the official crest (Memento) and gifts to him. Mr. Palash Chowdhury, Director (Finance) and Mr.Mahabubur Rahman, Director (Social Development) remember their memory with Adv. Billah during the time of hardworking for establishment of YPSA. They said, during 1985 YPSA only worked in one village named Mohadevpur of Sitakund Upazila of Chittagong but within 29 years, about 900 villages of whole Chittagong division are now under working coverage of YPSA. Due to diversity of working issues and management capacity, presently YPSA achieved prime position among all other non-government organizations of Chittagong Division. Advocate Moktader Billah said, “I am very happy to see the present status of YPSA and its diversified activities and achievement within 29 years. I always feel great while memorizing the period of establishment of YPSA and I strongly hope that YPSA will expand its working coverage to cover the whole country near future with innovative and community need based programs”.